1. I've pretty much settled on copper ala the old LP Goldtops? Where could I buy the paint? Is Reranch still in business? I found a website but no one answered the phone. Other sources? 2. I know some of you have had issues with some paint brands. Which ones should I steer clear? 3. Is there an advantage between copper foil versus shielding paint in the pup cavities? 4. For finishing, do ya'll prefer Tru Oil, poly, or nitro? I want a bit of sheen but not too shiny. I ordered the paint for Mike’s guitar from reranch. I think they’re a small family outfit. They are still a great source of paints. I’m spraying clear nitro over the color. Also from rr. I’ve got no experience with spray sheilding. Thanks! I can see the Copper Metallic when I do a BING search but not when I go directly to their site. I wanted to call and see if they're still carrying it. There’s another site, but I don’t remember what it is. This was a place Aaron mentioned. If ya gotta do the Home Depot/Lowes route (like I did with the blue Strat) don't use the Rust-o-leum "paint and primer" products. It works. It's harder to get a decent finish out of. I did manage to get this latest Nashville build finished with some of that. But it weren't easy. Copper Tone Metallic...that's the color. "...don't use the Rust-o-leum "paint and primer" products. It works. It's harder to get a decent finish out of." Hey Leftee - that's disappointing to hear. After my Dulux Duramax fiasco, I got Rustoleum (mainly due to colour option) to do my current build. I've only got the primer on there (I opted for a separate primer despite what their claims may be) but I still have the colour coat & clear on the shelf. Wondering if I should take it back for a refund and get something else. I went with all Rustoleum products to avoid any mismatch/adhesion issues. This is my first guitar job using enamel and it's already proven to be a PITA with the first attempt. Can you elaborate on what your issues were please? I could go back to my usual lacquer, but that would mean stripping and re-priming the body AGAIN. Being disabled atm, is preventing me from doing much in the way of running back & forth from the hardware store and I'm already overburdening my wife with other stuff. It’s the “paint and primer” mixed in the same can. They offer just enamel, and the “paint and primer” at my local store. The enamel is what I did the blue Strat with back in the spring and it worked great. The paint and primer product goes on pretty thick and gooey in comparison. You can make it work. But it’s not as easy to work with as the plain old acrylic enamel. 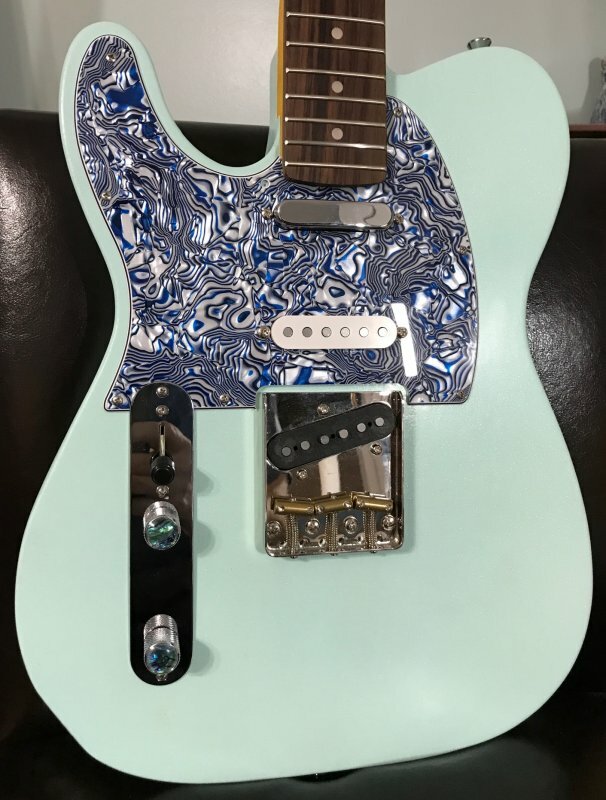 I did forge ahead, knowing that, and I did this second Nashville Tele build with one of the p&p products because of the color. It worked out but I had one screwed up body behind me at that point. The product they sell here is Rustoleum 2X (paint & primer). Which is weird because they also make a 2X Primer (???) and that is what I have the body now. Their claim is you get twice the coverage (presumably the 2X in the name). Even though it’s a hassle getting to the store, maybe I should consider a swap for “regular” enamel. I might have to rethink my colour scheme then. I’ve got plenty of time to contemplate it. Rain is forecast for the next few days; already had 4 days of it. Eric, that guitar is gorgeous. Nice! Here's another question. Is primer required if I use the copper paint? The Reranch site didn't seem to indicate it was required. You don't need to prime, but you need to seal the wood for the best finish appearance and durability. My preferred sealer/primer is Bulls Eye shellac. It's compatible with any topcoat and has the best adhesion of any sealer/primer. And it builds fast, dries extremely fast, and sands & levels very well. That’s the guy who taught me and that’s what I do. "That’s the guy who taught me and that’s what I do." Also, I had an opportunity to get to hardware store without too much inconvenience to anyone. Exchanged the Rustoleum for an Aussie brand. The colour isn't *exactly* what I envisaged, but it is close enough to the original concept.